we would like to report on a new math plugin for FCKeditor, both for ASP.NET and PHP. Equation editor WYSIWYG based on icons and palettes. Based on MathML. I would interested in know about your plugins. Unfortunately, the links provided by your are not working. Can you please check this? hkundra wrote: I would interested in know about your plugins. Unfortunately, the links provided by your are not working. Can you please check this? Could you be more specific? Which links don't work? WIRIS Tools can be used from a hosting service we provide. All you need to test the technology is available. There are some components, image service and mathematical engine, than can be installed in your server if needed. Those components are only provided to custumers interested in having everything installed in their server. Thanks ckeditor team and WIRIS team. I am already using the ckeditor and it works perfectly. Now, I need to provide a formula editor for my 'university question' bank project. As per the above post, I downloaded the fckeditor sample plugin and installed on my local machine. But when I enter my formula and press the accept, mathML code is shown on the picture instead of the rendered formula. However on the demo website the formula is rendered properly and displayed on the image. I did not make any modification on the downloaded pack. Is there any thing I have to do. Am I missing any PHP extension or any server side configuration? Note: all the folders on my www is writable. The mathml is shown because the image can not be created. Please, can you get the HTML code of the text inside the editor? In the HTML code, you should find a link to the formula image. If the link does not exists, can you post your HTML code in this forum? Otherwise, can you open this link in another browser tab? Doing it, maybe an error will appear. Please, can you post the error in this forum? Also i am facing same problem as jegatheesh. On local server is working properly but not on the live server. Will i change anything in the config file? In the fckeditor_wiris/formulas/ directory png file is create but in the cache folder nothing create that's why img not showing. In my local server img created properly in the both folder. The problem is the connection between your production server and WIRIS. Your server must be able to connect to services.wiris.net. Check your firewall or PHP configuration at php.ini. 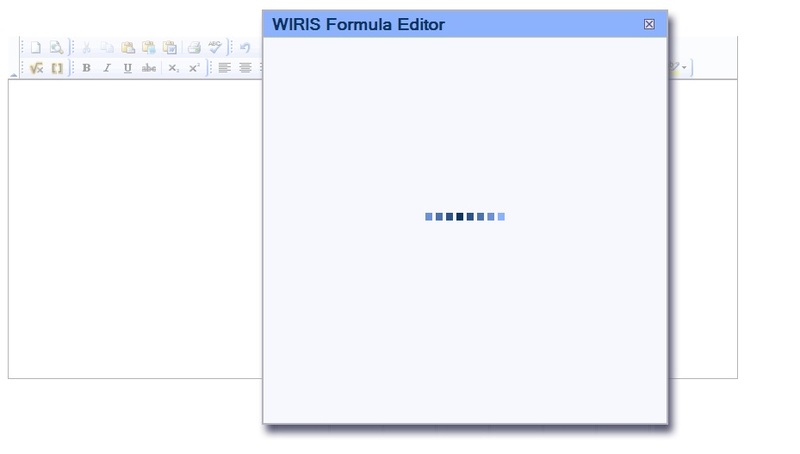 im facing the problem in the wiris formula editor only the xml script is genrated. 2) Save the page content on disk. 3) Open the content with a plain text editor, for example notepad. 4) Send the content to this forum. Server Error in '/WebSite3' Application. Exception Details: System.Net.WebException: The remote server returned an error: (407) Proxy Authentication Required. The problem is that your server is behind a proxy that requires authentification. Unfortunately, WIRIS Plugin does not support this kind of connections and is designed only for direct connections. We are working to enable connections through proxies on WIRIS Plugin, so we will release a new version soon. Can I install the image service on my local server machine? I have the fckeditor with wiris plugin embeded in a page which named abc.htm, and abc.htm is a page in a frame, now, the wiris equation editor can open, but when I press 'Accept', it doesn't work. While, if abc.htm is not in a frame, it works well. yestaerday we released a new version. Please check if the new version works better. Juan, will give you further support. Many thanks, I will try it now. The page works well in a singal page, but it get into trouble when i put it into a frame. I think there is some wrong occurs in the file "pluginwiris_engine/resources/editor.js". I upload a zip file that can recur my problem. Maybe it is useful for you to locate the error. Thank you for the bug report and the provided resources. We have released the new version 1.13.2. This version should fix your error. Please, report us your results if the error persists. Nice work! It works well now. Here is the xml generated.There is no image src in the generated. However, when I click on the xml, browser seems to handle it like an image. I was able to right click and go to Image Properties. Here the url in fckeditor image properties frame says "Error: can not create the image. Check your file privileges." Can you help? Where are the images stored, may be I need to provide proper permissions. directory was not writable and it needs to be. I did a chmod 777 to this directory and got the xml file to be written to it. but still no image. Is this a problem because of proxy as was mentioned in a previous post? I am not sure if my server has a proxy. I am also facing same problem when i am using FCK editor wiris plugin( asp.net 3.5) it shows me mathml instead of image of formula .I have pasted the source of ml below.PLease help me out if anybody have solution to this via er.deepak.garg22@gmail.com..
@Deepak: It seems that there is a problem in your server configuration. The server assumes that the user is trying to send dangerous code when he sends xml (mathml). At the moment, I have the WIRIS buttons in my FCKEditor, but when I click them, I get the dialog pop up put it sticks at the progress bar? Please see attached screenshot. Can you provide us some link to your demo? Just for reference, my initial problem was that my web hosts didn't set the virtual application up correctly. Then I had the issue where it would just show an image of the MathML, and I solved this by adding <pages validateRequest="false"> to the Wiris web.config file. I store all of the html created from wiris formulas in a database. When I export this HTML code straight into an MS Word document, I cannot see the image. However, if I manually drag over the image and copy it it from my webpage, then paste it into MS Word the image displays? I doubt anybody knows why (and it's not really an FCKEditor issue) but if you do, please let me know.